You may think that you've enjoyed the best of waterfront dining but unless you've seen this Noosaville restaurant, you ain't seen nothing. The Boathouse Restaurant (194 Gympie Terrace) is a floating restaurant that is moored on the Noosa River, located on the Sunshine Coast. The venue has three levels and as a result, affords a spectacular view; positioned as it is, the restaurants offers views of the river, as well as the Sunshine Coast hinterlands. The first level, or the water level of the Boathouse, houses the Galley Bar and Restaurant. Here, you can enjoy waterfront dining at its most literal. The restaurant is open from 10.00am and provides an Australian bistro style menu, heavy on the seafood. The three tiered seafood platter has become the restaurants signature dish. With entrees around $15 and main meals around $30, it is a little more expensive than your average restaurant. If money is tight, take advantage of the lunchtime special – two courses and a glass of wine for $28.00. On the second floor is the River Room, an ornate function room that can seat up to one hundred and ten guests. The River Room boasts a dance floor and panoramic views and is hired out for weddings, functions and events. The Bridge Bar can be found on the third floor, or the top deck. The bar is a modern cocktail venue that is open on Friday, Saturday and Sunday. 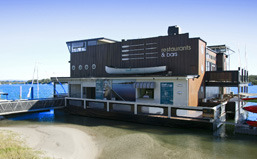 The Boathouse Restaurant provides customers with a unique, albeit slightly more expensive, dining experience in the middle of the Noosa River.